What Standards Are Controlling Your Life? “The images bombarded me. They filled my mind with lies, these fantasies of what could be. -An entry in my journal from a few days ago. Ever since I got married, only a little more than a month ago, I had my heart and soul filled with high ideals. Thee ideals arose from good intentions. My husband is this incredible man; this dream guy that I can’t believe I get to be best friends with and do life with forever. But somewhere in the midst of work, health issues, running my own ministry, and being a full time wife, I found myself deeply overwhelmed and failing. Will there ever be enough hours in the day to do it all? My own disappointments at failures I set myself up to left me frustrated. My husband, sensing my frustration, reminded me that I can’t do it all…and that’s okay. He also reminded me that I need to allow myself grace. This astounded me. Something so simple, yet so powerful. I won’t always be able to be a full time wife, keep a perfect and spotless home, cook meals, make time for yoga, work hard, run a ministry, spend time with God, and make time for friends and alone time all in the same day. But I suddenly realized that neither my husband or God expected this of me. God simply calls me to be loving, kind, patient, serving, and respectful. My husband simply calls me to be his best friend. The world, however, calls me to have a perfect body, a perfect home, a perfect career, and a perfect marriage at all times. Who have I been listening to? What lies have filled my heart and contaminated my soul? This, my friends, is a serious spring cleaning. I am cleaning my heart, mind, and soul of every lie and expectation that is not from the two men who love me most: The Lord and my husband. As anxiety and pressure consumes you, I wonder if you could be set free if perhaps you would listen to a different voice…focus on the Father…hear from those who truly love you and want your best. Like God, my husband reminded me that he wouldn’t love me less if dishes were left in the sink, if laundry waited an extra day, or if a shelf wasn’t dusted. His love is not conditional. My joy is more important to him than a spotless home. This isn’t my post about how I have it all figured out. I am a work in progress and want to walk this out with you. 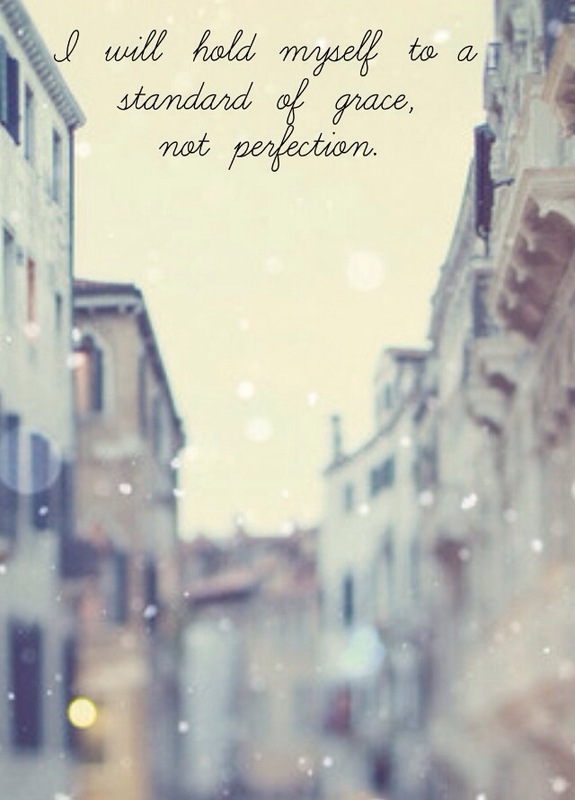 How could your heart change if you held yourself to a standard of grace rather than perfection?